Eliminating many of the problems that may lead to carpet needing to be replaced before it’s time. No longer worry about concealing those discomforting spots, marks and dried in spillages. Professional cleaning can ensure removal of most stubborn stains. Removal of general dust, soil and accumulated debris. Professional cleaning of even the oldest of carpets can significantly improve their appearance meaning you no longer have to be embarrassed by them. Most odours can be eliminated by general professional cleaning and we can offer specialist treatments to ensure a fresh, clean smelling carpet. Although you may vacuum your carpets on a regular basis to maintain their outward appearance, there will always be a certain amount of dirt still held deep in the pile beyond the reach of even the most effective domestic vacuum cleaner. Our staff are trained on how to identify which type of carpet you have which is critical to get the best results and avoid any damage to your carpet. 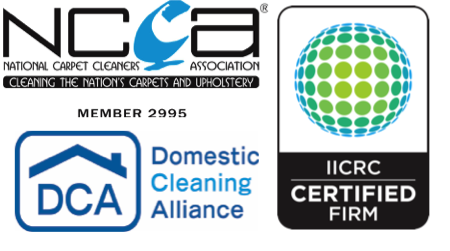 Our staff are accredited by the IICRC and are members of the National Carpet Cleaning Association so you can be assured of getting the very best services from us. Call us to arrange for a free inspection and quotation on 01985 217004 or contact us via the form below. No matter how careful you are, stains, marks from pets, children, and general wear can build up making your carpet look old and tired. The solution is to have your carpets regularly deep cleaned by a professional carpet cleaning company using commercial equipment and fully trained staff. Please note; every stain is different and it is a specialised job to remove all stains or marks from carpets. We can not guarantee that we can remove all spots and stains from carpets but we do believe if we can’t get a stain out it won’t come out! Spilt something? Here is what to do…. If you have a spill, remove as much of the spill as possible by soaking up with a paper towel. Do not rub at the stain. It is understandable to want to try and remove the stain yourself with a domestic stain remover and in a lot of cases this may work but it can also lead to the stain getting locked into the carpet making it much more difficult or nearly impossible for us to remove it later. If you can call us as soon after the spill as possible we may be able to quite easily remove the stain completely.